In a world where so much can be explained through science and rational thought, it’s nice to know there’s always a little something that escapes logic. No matter how educated we are, most of us still avoid walking under a ladder and feel a sense of dread when we break a mirror. But where and how did these strange notions arise? From the curse of the lottery winners to the good feng shui of a local restaurant, this quirky, wacky, weird and wonderful collection of superstitions sheds light on the truth about some of our most familiar beliefs. It also delves into others that are much stranger. It turns out that everywhere in the world, people still put their trust in luck, magic, and mystery. A fascinating book! 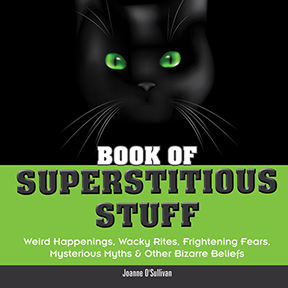 BOOK OF SUPERSTITIOUS STUFF: Weird Happenings, Wacky Rites, Frightening Fears, Mysterious Myths and Other Bizarre Beliefs By Joanne O’Sullivan. 192 Pages. 6x7 Hardback. Illustrated. References.